You must make reservations at least 5 minutes in advance of the time at Boot and Shoe Service - Oakland. Boot & Shoe Service is located on Grand Avenue right by Lake Merritt. We pride ourselves on providing exceptional service, delicious seasonal fare only using local ingredients in a warm and eclectic atmosphere. Great food with interesting flavor combinations. The space is interesting. The music was a bit too loud for conversation. Good spot to take a date and the service was very welcoming and so accommodating. I would definitely go back for the lamb bites. never have had a boring pizza or salad in 10 years! Ask about the vegan pizza! Always delicious. Everyone enjoyed their meals (pizzas, pastas, salads). Drinks were great too. Nettle pizza. What's not to love. Wine Wednesday. Half price by the bottle. Only challenge was that they did not have a table available at the time reserved so we sat at the bar.. which we enjoyed. Innovative Dishes, such as the Pastrami Nuggets, the Salads where solid, and the wood fired Pizzas had interesting choices. This is one of my favorite, go-to restaurants in Oakland. I always experience friendly, welcoming service and great food. The seasonally driven menu is great, not too precious yet innovative. Don’t even get me started on the cocktails!!! Delish. We ordered for four, 2 pizzas and two appetizers along with bread and olives. Perfect meal. I will definitely be back. Really wonderful staff - so accommodating to our party's questions and concerns and the food was outstanding! can't wait to go back to try more of the menu! We go here all the time - the pizza is amazing. I also got the chicory salad this time and loved it. We will definitely be back! The drinks were fantastic, the food was yummy, and the service was stellar. The hospitality was really spot on, so nice, attentive and lovely. The food is really good, the chicories salad was so inventive and tasty. Such a good operation here. We've been meaning to come here for yrs and yrs and finally had a chance. Maybe that's a good thing with all the changes it's gone through. All that has been said in the past, is still very true of Boot and Shoe. 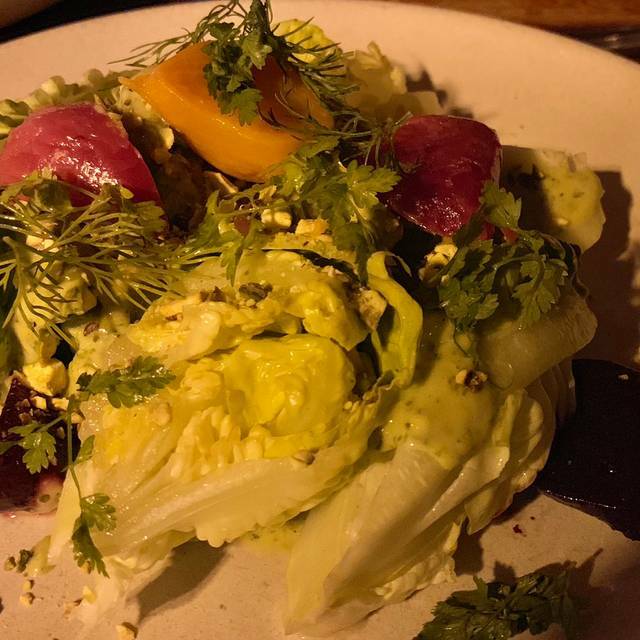 It's a wonderful space, amazingly flavorful and colorful foods, ambiance and mood is romantic and cozy and the STAFF and SERVERS were friendly,welcoming and gave excellent service-nothing pretentious. We brought our 15 yr and 12 yr old boys who throughly enjoyed the experience. It is our new favorite spot, though it's been around for years. We're happy that we found it. Everything was delicious, but the pizza is always a standout! Slightly charred crust, but still pillowy! Yum! Amazing dim environment. Great service, amazing cocktails and beer menu. We loved the crafted salad and wood fired oven pizza. They're getting their legs back! Food offerings are a little more diverse. Great pasta, love the dough on their Pizza! Service is definitely improving. Happy to make this place part of our regular neighborhood spots again. We are regulars but the food on our last trip was just so so salty it masqued the simple fresh local seasonal ingredients. What a shame. The sweet delicate crab on the toast was just lost as where the sea scallops & cabbage dish. Delicious wines, interesting salads and “small” plates, very professional severs. Didn’t try the pizza but it smelled good. Great atmosphere, good service and delicious sharing food with quality produce. The house made ginger soda is delicious! Only criticism is that the pizzas are a little burnt. Great place and excellent menu. Wine menu needs help. I really like the food here but a glass of wine ranges from 14 to 30. I had 2 for 19 each which I didn’t realize until I received the check because I asked for a recommendation and never saw the price. The cost of 1 pizza and 1 salad with the wine and tip cane to more than 80 bucks!! Menu is a little spars and not necessarily to everyone's taste. It is however, different and one might say novel compared to a traditional Italian restaurant. It is pricey but prepared using good quality ingredients. Pizza was very good, particularly the base. Would I go back? Maybe. I would recommend a one time visit though. We started with some tasty creative cocktails, then ordered a variety of food to share; steak, pizza, salad, and pasta which we thoroughly enjoyed . I went with the kids and they were happy with the pizza and went for the more adventurous dishes. All in all everyone like what they had. We will definitely be back. It’s not what it used to be. Dark to the point of ridiculous and when we used our phones to be able to see the menu the table across the way complained to the server that we were shining a light in their eyes ...🙄 whatever vampires. This used to be a destination spot for birthdays and celebrations but the food is mediocre at best and the price point is just not where it should be. I was super sad because this was THE place for pizza and now.... meh. Crust no longer crisp and the nettle pizza was downright soggy. Such a disappointment. Freezing cold inside. No heat. First time and loved the food, every dish. Very creative dishes which were delicious. Can't wait to go back. Server's recommendations were perfect. Thank you. As promised. Then she completely forgot to put one of our dinner orders. She was preoccupied. Finally when I asked her she realized I didn’t have my dinner. Had a reservation for four people at 8PM. We arrived 20 minutes early but were not seated until 9:20PM. Food was meh. Service was great. Happy to wait 10-20 mins after my reservation, but an hour plus is ridiculous. At least comp our corkage, toss an appetizer at us... something. Hugely dissapointed by this past dining experience. Great place. Pizzas and ragout are my favorites, but really, all the food is great. Always love Boot & Shoe. Food was great, as always, but the portions were TINY. We ordered a scallop dish that had 3 smaller than usual scallops for $22 and a pasta dish that was about 4 bites at most for $20. Again, both were delicious, but it seems a bit much for such tiny potions. Only other mild issue is the noise. With the music being loud and the diners contributing to try to talk above the music, it can be a bit much. That said, again, food is great, drinks were great. It was a great dinner. We had a nice date night on the back patio. The heaters are warm enough for the fall weather. Outstanding Pizza, one of the best I've had in a long time. Got a margarita with Anchovies and sausage added. Fried Chicken was excellent but that was a one-time thing. Only complaint it's a bit noisy it could turn the music down a bit and I guess it's not their fault but it's a young crowd and they laugh a lot. Service was absolutely outstanding and the food prep was unique and fresh. I enjoyed my overall dining experience very much and will highly recommend to others to experience themselves. Just all around good! Everything delicious. Service attentive & fun!